This isn’t the first time MakerBot has grabbed headlines here at Geeky Gadgets. The 3D printer made its presence felt at this year’s CES to remind everyone of the material future waiting for us—a time when consumers will design and build and print their wants in a snap. Okay, so the future isn’t exactly here yet cos most of us still haul ourselves to retail outlets for buying stuff. But the MakerBot Thing-O-Matic marks a giant leap nonetheless. 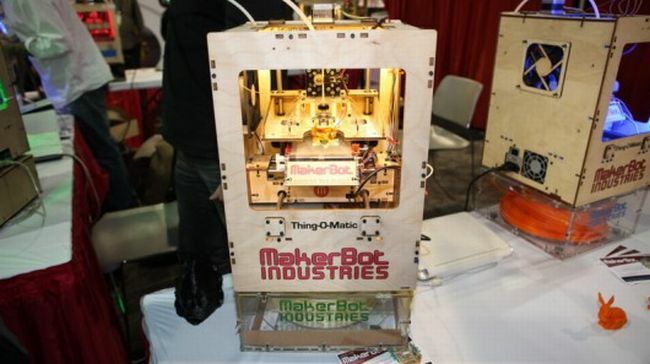 What’s featured in the pic above is the MakerBot that wowed the willing at CES 2011. The printer was on sale in kit form and it works exactly like your trusty printer—plug it via USB and design whatever it’s gonna print. Also part of the kit is a pound of ABS plastic. Aside from its USB capabilities, the MakerBot is also SD card compatible and can be reloaded with ammo, er, plastic in mid-print. While a huge variety of stuff is within the capabilities of a MakerBot Thing-O-Matic, please don’t expect it to build you a girlfriend or a surrogate sibling. But personal action figures are okay. All this awesomeness comes at a (steep) price: a single MakerBot Thing-O-Matic will set you back $1,225 and take seven weeks for delivery.